Devotees of Amma steal Sri Lalita title under noses of subtle system SYs twiddling thumbs! M.A. Math has published a chanting book, a Lalita Sahasranama commentary and a book by Amma on pujas and Her revolutionary Brahmasthanam temples. 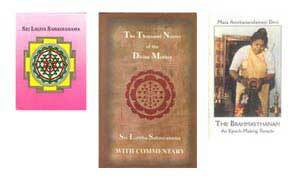 Sri Lalita Sahasranama is the Amritapuri chanting book. It contains the 108 names of Amma, the 1,000 names of the Divine Mother, the 108 names of Devi and other prayers regularly chanted at Amma's ashrams. This book offers in-depth commentary on the Sri Lalita Sahasranama, the 1,000 names of the Divine Mother, which is chanted daily at Amma's ashrams. The original Sanskrit is also included along with translations of the names into English. > > the paths are many, the destination is one???? > the present pace of progress. i have just been checking up on Amma. Their official website is not only impressive but daring. Yesterday i come across one of her forums that actively induce others to believe that she is an incarnation of Shri Lalita Devi, the great Goddess. This is truly amazing as academicians and professionals have joined hands in a collective effort to announce Amma as the great Divine Mother. And i believe this organization, unlike CEOs running Sahaja Yoga from ivory towers, is getting its act in order. If the SY elite think they can continue ignoring reality from those dizzying heights and do not come down to earth, they are going to get a nasty surprise. Given that Amma is only 53-years-old she is going to snap up the subtle system slums and turn them into glitzy Universal Motherhood ashrams. Who wants to continue living in our slums when their glitzy ashrams offer warm hugs, instead of daily negativity and weekly bhoots, all the way to heaven? But the recent national seminar in Australia and subsequent N. American newsletter has dashed all hopes, albeit faint, that anyone will tell the truth. No one seems to care or is concerned anymore. So this pointless pondering will continue to fall on dead ears. Ah! yes, we were talking about Amma and her devotees dedicated to proclaim her as the Divine Mother, despite having so little. What would Amma's followers have announced and achieved if they had the same experiences and knowledge we SYs have? ................... or the incarnation of the Great Goddess, the Shakti of All, as a Mother?